Product #20673 | SKU 027500-0101-230 | 0.0 (no ratings yet) Thanks for your rating! 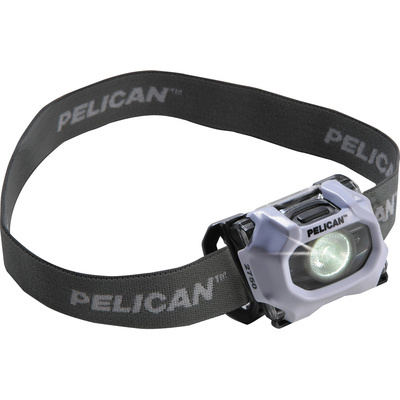 The white 2750 LED Headlight from Pelican features a hands-free headband design that gives you use of both hands while providing a maximum of 100 lumens of illumination. The low 40 lumen output conserves battery power, providing up to 12 hours of runtime. The flashing-mode outputs at 100 lumens as well, making it perfect for signaling. A smaller red LED has dual on and flashing modes, and protects night-adapted vision. The head pivots up to 45° to put the light exactly where you need it. Click-stops, at regular intervals, ensure the head stays in place while you work. The durable polycarbonate housing is impact and temperature resistant and the rubber head plate makes wearing it comfortable.